The conventional mode model is based looking at a single person and their biographical imprints resulting in schemas and coping styles. Schemas result from interpersonal experiences and tend to be acted out in current relationships (Young et al. 2003). So there is already an implicit interpersonal thinking underlying the schema model. Additionally, our partner selection is schema driven based on what Jeff Young called “chemistry”: In a nutshell that means that we choose what we already know and do what we already can. We often end up in what Jeff Young called “life traps” (Young 2012). Understanding current relations problems including the therapeutic interaction based on an interpersonal schema therapy model seems helpful – if not necessary - to improve them. Such an adjusted mode model for supervision purposes and for treating couples has been outlined (Roediger & Laireiter 2013; Simeone-DiFrancesco et al. 2015). The core concept of the interpersonal mode model focuses on the mode cycles between the coping modes of the partners. Relationships tend to stabilize themselves in a number of mode cycles, in a more or less functional way. If these mode cycles become unsatisfying one partner might enter therapy. If we consider that most of our patients live in current relationships the changes we induce in an individual therapy will impact their relationships and will likely destabilize them. From a systemic viewpoint our patient´s partner will tend to undermine the therapy changes to keep the relationship and the interpersonal mode cycles stable. Patients may feel torn between their work with their therapist, striving for change and their relationship with partner working against it. This is challenging both for patients and therapists. •There are three major coping modes related to the animal model: Overcompensation (fight), Avoidance (flight) and submission (surrender). •There are 4 relevant basic emotions (Ekman 1993) connected with 2 underlying child mode poles: fear and sadness (related to the vulnerable child) and disgust and anger (related with the angry child). •These basic emotions indicate that the 2 major underlying core needs are not met: The need for attachment (activating primarily a vulnerable child) or the need for assertiveness (leading to feelings of disgust or anger). Advice: According to Les Greenberg sometimes a primary sadness can be hidden behind a secondary anger (Greenberg 2002). 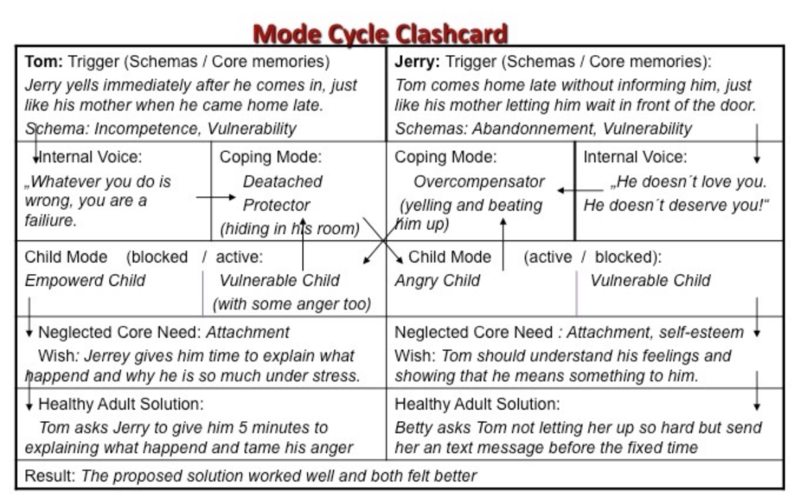 The goal is to resolve these mode cycles by bringing the healthy adult mode to the forefront to effectively balance the two partners core needs. Without this balance, each partners maladaptive coping modes may conflict. One partner, operating from a maladaptive coping mode, may fight, being overly assertive, leading to a loss of attachment. 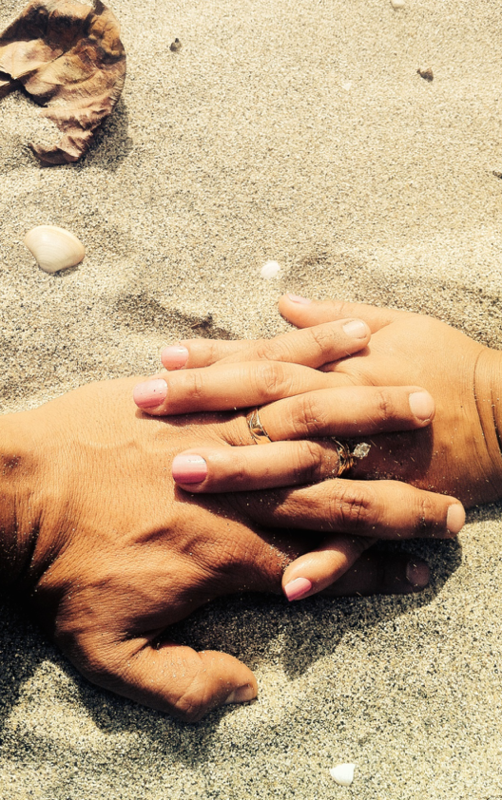 Using a strategy outlined in the Schema Therapy with Couples book, couples aware of their schemas and coping modes and work together in a healthy way to assure that both partners core needs are heard, understood and ultimately met (see fig. 1). The core step is identifying the active child mode while being mindful of the neglected, vulnerable mode. With overcompensatory coping this is quite easy to identify; it is based on an angry child mode and the assertiveness need. While less obvious, the same is the case for angry protectors. In both cases getting in touch with the blocked out vulnerable child and the underlying attachment need is crucial to creating a will to reconcile. In contradiction, submission is driven by a vulnerable child and the need for attachment, as for fearfully detached protectors. In both cases the partner deep in their heart linger for someone strong enough to lean and rely on and the withdrawal fuels their desperate overcompensatory modes strive for safety. Strengthening the assertiveness skills of the submitting or avoiding partner is required to soothe the hidden attachment need of the overcompensatory partner. This simple tool provides the patients with a compass to re-balance their relationship. In a couples therapy this process is mediated by the therapist in the presence of both partners which is the most promising way achieving a good and lasting result. If we can gain the interest and trust of the incoming partner he or she can be include stepwise deeper into the process up to a couples therapy making a good outcome much more likely. The process in the supervision of an individual therapy can be based on the same mode cycle concept in order to understand the interaction of the therapist with his or her client. The assumed emotional experience of the patient has to be detected with the help of the supervisor using their mentalization capacities (Fonagy et al. 2004) to fill out both sides of the Clashcard. In this case using video tapes of the therapy session supports this process to understand what is going on the patient and tailor the therapeutic interaction to meet their needs best. Ekman, P. (1993). Facial expression and emotion. American Psychologist, 48:384–392. Fonagy, P., Gergely, G., Jurist, E. and Target, M. (2004). Affect Regulation, Mentalization and the Development of the Self. Karnac, London. Greenberg, L. (2002). Emotion-focused Therapy: coaching clients to work through feelings. American Psychological Association Press, Washington DC. Roediger, E., Laireiter, A.R. (2013). The schema therapeutic mode cycle in behavior therapy supervision. Verhaltenstherapie, 23:91–99. CCC-Code: 1016-6262/13/0232-091$38.00/0. Young, J.E. (2012). Schema Therapy with Couples, DVD. American Psychological Association Series IV Relationships hosted with Jon Carlson, www.apa.org/pubs/videos/4310895.aspx. Young, J.E., Klosko, J.S., and Weishaar, M.E. (2003). Schema Therapy: a practitioner’s guide. Guilford Press, New York.